Home / Find out why we’re leaping for joy in 2016! At Wedding Letter Hire we love nothing more than to bring a touch of sparkle to your special occasion. Our letters have been seen on the catwalks, at anniversary parties, bar mitzvahs and of course at weddings. However we’ve never been involved in a proposal before so we literally ‘leapt’ at the chance of helping some lovely ladies propose to their partners on the 29th Feb this year. As you may know it is an ancient leap year proposal tradition that women are able to propose every 4 years on the 29th February – and in 2016 there were many brave ladies all looking to take the plunge! Our first assignment was to help Sam Probin propose to her boyfriend Craig who she has been with for 5 years. As this was such a special occasion she wanted to get things just right and so called in The One Romance who are expert proposal planners. They really wanted to make the occasion shine for Sam and her beloved so they decided to use our 5ft illuminated letters to create the perfect leap year proposal scene! Sam chose the romantic location of Hedsor House in Buckinghamshire to pop the question. 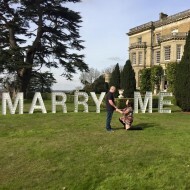 Luckily the sunshine came out allowing our letters spelling out MARRY ME to be placed in the beautiful and picture perfect grounds of this stunning stately home. We were rooting for Sam as she got down on one knee in front of our letters and asked the big question! We don’t think anyone could resist such a fabulous leap year proposal idea and Craig said a resounding yes – he was really amazed by his unique and personal proposal and we wish the happy couple all the best in their future together! Sam and Craig’s story has even been featured in the Daily Mirror where you can read more about their story and see some great pictures. Then, as if one leap year proposal wasn’t enough excitement for us, we were called on to help Brides Magazine celebrate the 29th of February with not one, not two but fifteen wedding proposals! These ladies were also doing things in style by proposing to their unsuspecting partners in the sumptuously romantic setting of The Savoy Hotel in London. The 15 women were understandably pretty nervous as they arrived and chatted to each other about the reasons why they were proposing. It was great to see them supporting each other and Brides Magazine made sure that they all felt really special by doing a full makeover and ensuring that they all looked stunning! It was fantastic to see all the different reactions of the men as they got proposed to and luckily they all said YES! Afterwards the happy couples partied and celebrated with a glass of champagne and our gorgeous illuminated letters glittering in the background! We are so thrilled for them all! To see the full story take a look at this fantastic film by Brides Magazine. Well, February was a brilliant month for proposals and it looks like 2016 is going to be a great year for weddings too! We love bringing sparkle to these happy couples and if you’d like to find out how to add a touch of glamour to your big day just give us a call. Our lighting hire team will be happy to help!